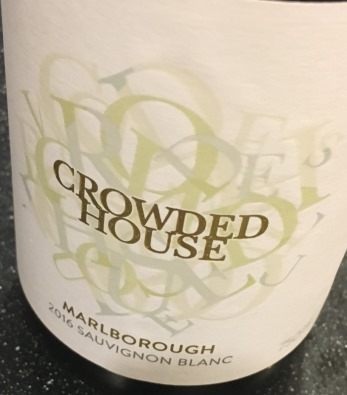 Crowded House Sauvignon Blanc is an estate-grown wine, crafted by Peter Jackson (not the director, mind you) and vineyard manager Fraser Brown, who work with vines planted in 2004 in the Waihopai Valley of Marlborough. The first release was in 2006 and they’ve been rock stars in Australia and New Zealand for some time. But pretty much unknown in the U.S. Until now, perhaps? An amusing aside is that the name Crowded House doesn’t come from the band name (Jackson makes fun of the misconception in this charming video), but from the fact that the Marlborough wine region is crammed full of vineyards now, instead of the sheep grazing fields of 30 years ago. Might as well face the stiff competition head on, right? Smart. Tart and lovely grapefruit flavors blended with aromatic peach, tangerine and crisp lemon. Refreshingly full of New Zealand personality and verve but the acid is balanced with a slight touch of sweetness. An absolutely perfect summer day grog — at the beach, poolside or patio. The finish is calm, cool and slightly tart. A lot of delicious wine for not much money too. Occasion: Enjoyed on the patio one cool evening with some fresh goat cheese. Sample sent from winery. Availability: Available nationally but have more distribution on the west coast.